January 17, 2019, 12:38 AM · Disneyland this evening previewed its "Get Your Ears On - A Mickey and Minnie Celebration" for a small group of invited reporters, including yours truly. It's too bad that Disney didn't allow us to video the show, as the short clip above doesn't do it close to justice. The full show runs about 12 minutes and includes EDM-styled remixed of music from The Aristocats, The Jungle Book, Aladdin, The Haunted Mansion, Coco, and — there's no escaping it — Frozen, in addition to the new theme, "It's a Good Time," by Ali Dee and the Deekompressors. The show does best when it embraces its EDM beats and tries something different. I wish that Disney went further with the concept, actually. The show needed that great drop that never came. But it's amazing to see lasers shooting from the castle down Main Street, especially on a foggy or rainy night, when the air has that extra medium for the lasers to really come alive. But for the best of the projections, head to the Small World plaza, where you can see the animation much more clearly than you can on the more diverse facades of Main Street, which tend to swallow projections. Still, I did not know that I needed an EDM remix of "Everybody Wants to Be a Cat" in my life, but I am glad to discover that I have that now. 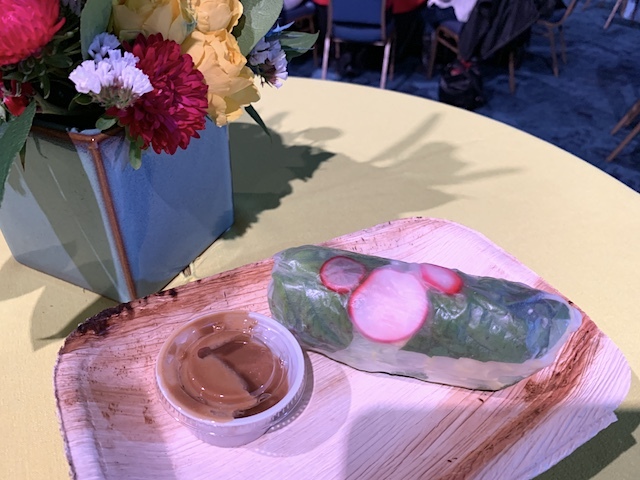 Earlier in the evening, Disney representatives showed off some of the new food specials that will be available for sale throughout the resort for the celebration. And we got a look at some of the "Get Your Ears On" souvenirs, as well. Yes, she did say that Disney would be selling spirit jerseys for dogs soon. Um... I got nothing. In between the food and merch reveals and the Mix Magic show, we got a sneak peek at the new float that will lead off the return of Mickey's Soundsational Parade, which returns to Disneyland on Tuesday, January 25. We were not allowed to take photos of that, either, but it's a 19-foot tall Mickey Mouse playing a drum and cymbal, in the same "paper cut-out" style as much of the rest of the parade. Goofy will pull that float to start the parade, replacing the gong from the original production. Chip 'n' Dale will follow with a 12-foot "birthday cake" float to celebrate the 90th birthday of Mickey and Minnie Mouse. Get Your Ears On - A Mickey and Minnie Celebration starts this Friday. No word yet from Disney on a closing date. Not that excited about the return of Soundsational, the paper cutout style always seemed to be cheap to me, not like fully sculpted figures. But I guess it fits the style of the Mickey shorts, if that's what it's going to feature. Mickey's Mix Magic sounds great! We need more of that and less of the schmaltzy American-Idol-esque stuff like Happily Ever After. I love the fireworks, but that soundtrack is so hit and miss. I got to sample a few of the food items that will be coming to the festival. 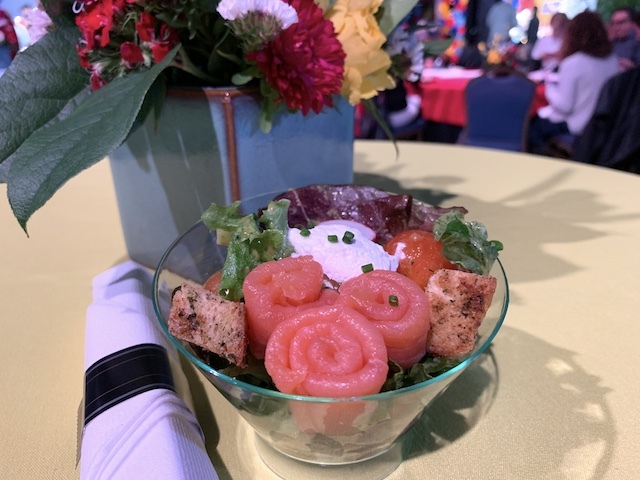 The highlight was the salmon salad from Cafe Orleans, which included cherry tomatoes and creme fraiche. I also enjoyed the Pad Thai Spring Roll, which is coming later to Bengal Barbecue. It's a bit fat for a spring roll, but I enjoyed the shrimp, and it comes with a cashew-hoisin dipping sauce. 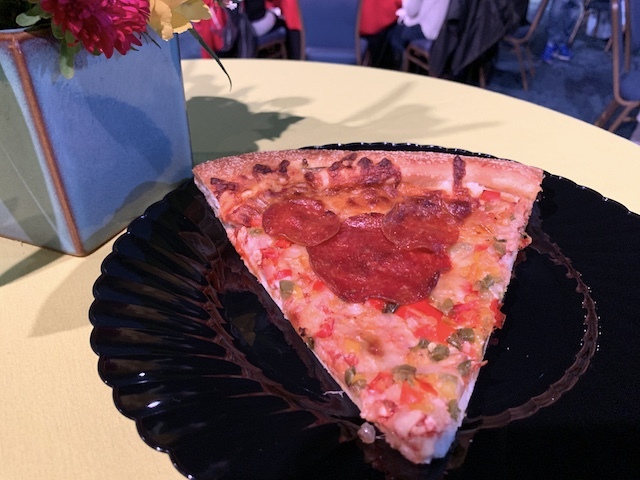 The Mickey pepperoni pizza from Boardwalk was typically Disney pizza - too bready for my taste. If I want a pizza at Disneyland, I'm still heading over to Naples and Napolini. The desserts are Disney sweet. The macaron has that cool effect of the sprinkles falling out when you break it open, as demonstrated in the video above. It's cotton-candy-flavored inside. The cake (shown in a sample size here), has a lemon kick that cross the line from brightening the flavors to making it a bit tart. 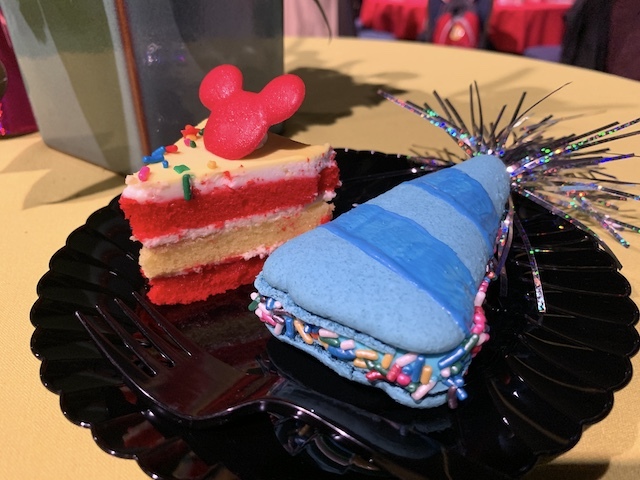 The cake is coming to the Plaza Inn and the macaron can be found at the Cozy Cone. Hmmm... that music is, at best, electronic-adjacent, but in no way is it EDM. How was it during the actual presentation?